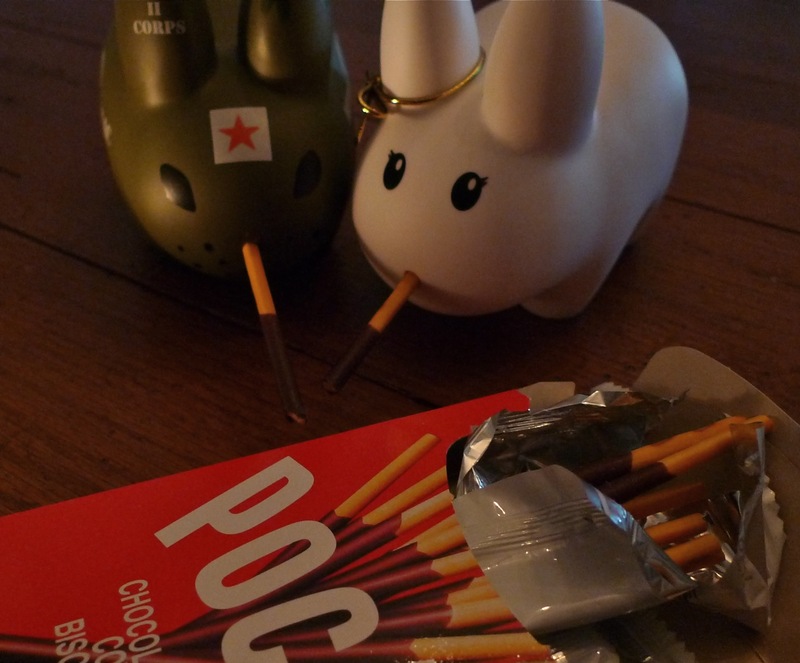 Year of the Labbit: Stir Friday! 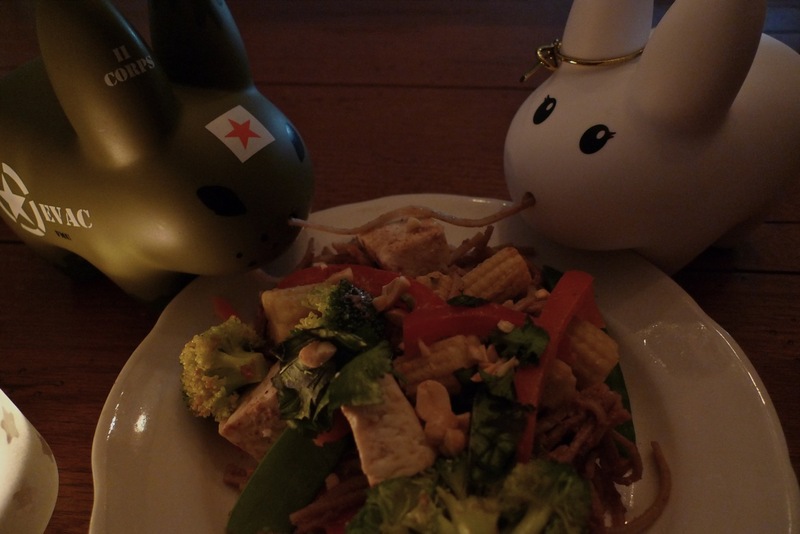 What's better than getting together with your sweetie on a Friday night to chop up some veggies and toss 'em in a giant pile of noodles with spicy peanut sauce? It's Stir Friday! Like pizza, stir fry is a versatile dish. Pick your veggies, chop 'em up, heat up some oil in your wok, and stir fry! Candlelight! Captain Holly knows how to woo. Captain Holly is a native New Yorker and misses all the great Asian cuisine he had in Manhattan. The louder the restaurant, the later it stayed open, the cheaper the plastic disposable tablecloth - the better the food. 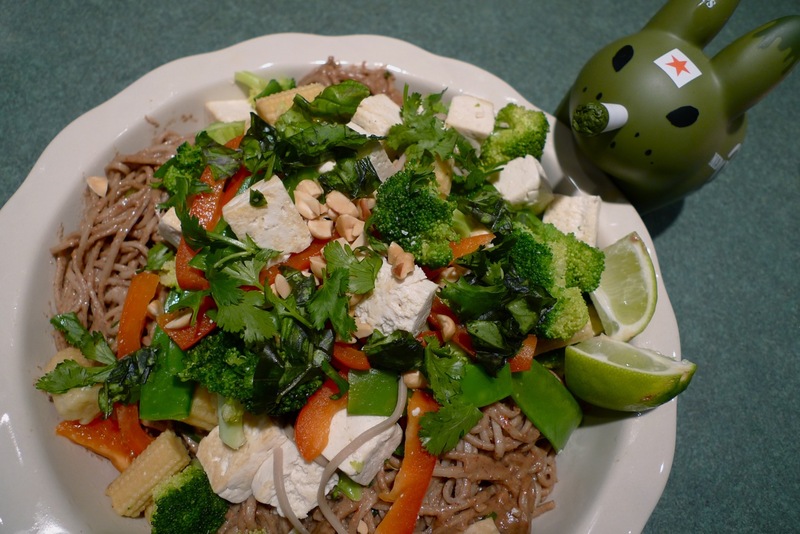 Here he shares with you one variation on a veggie stir fry, but make it your own with any veggies you like. Captain Holly recommends: carrots (duh), snow peas, baby corn, bamboo shoots, water chestnuts, shiitake mushrooms, bell peppers, broccoli, green onions...just make it colorful! Holly cooked up some soba noodles according to the directions on the package (this will vary on the type of noodles you choose). Then he tossed it with his spicy peanut sauce, and served the stir fry over top with cilantro and basil, chopped peanuts and a squeeze of lime. For dessert, nothing beats Pocky! *You can substitute plain hot water or green tea or coconut milk. Coconut milk will result in a richer, thicker peanut sauce. Prepare the sauce: Heat oil in a small saucepan over medium heat. 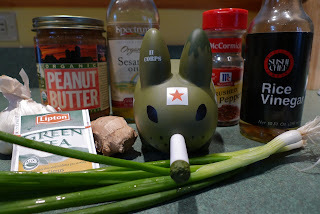 Add in green onion, garlic and ginger, and cook, stirring often, for one minute. Add the peanut butter, soy sauce and red pepper flakes. Slowly add in the hot tea until you reach your desired consistency (labbits like thick peanutty sauce!). Slowly add rice wine vinegar to taste. Simmer until smooth. If you like you can blend with an immersion blender or in your food processor for a really smooth consistency. Keep aside, allowing to cool slightly while you prepare the rest of the stir fry. Noodles: Directions will vary depending on which noodles you buy. Follow the instructions on the package, then toss with peanut sauce and keep warm. Stir fry: Heat oil in a wok on medium-high heat. Add tofu and stir fry gently (tofu can get crumbly) until lightly browned, about 7-8 minutes. Remove from pan and keep warm. Add veggies and stir fry for 3 minutes. Return tofu to wok, and toss gently to mix. Serve over warm peanut noodles and garnish with chopped cilantro, basil, peanuts and lime wedges.